Circumstances meant that, unfortunately, the day that Test cricket came to Ireland I was on a ferry from Dublin to Holyhead. Otherwise, I would certainly have made an effort to get a ticket. Although it’s a minor sport over here, those who play it are really dedicated to the game. 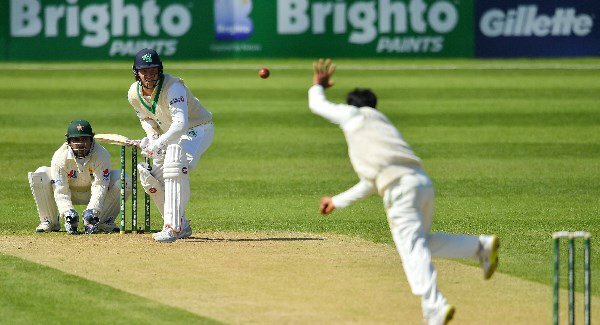 In an article in the Irish Times, Niall O’Brien describes how the players of his generation ‘fell in love with Test cricket while watching it on the BBC in those long summers of our childhoods.’ How great it was that during the match his brother Kevin should become the first Irishman to score a Test century. Soon after 10am, the Irish players gathered together on the outfield while the chair of selectors, Andrew White, set down a scruffy cardboard box full of handsome new caps. He handed them out one by one, the first to captain William Porterfield, then the rest in alphabetical order, Andy Balbirnie, Ed Joyce, Tyrone Kane, Tim Murtagh, Kevin and Niall O’Brien, Boyd Rankin, Paul Stirling, Stuart Thompson and Gary Wilson. The first Irish Test XI. At least a couple of them started to cry from pride. Being away means that I wasn’t even able to see the highlights, which were broadcast each night on RTE. It looks as though Ireland acquitted themselves well, having a chance when they reduced Pakistan to 14 for three in their second innings. Class prevailed, however, and the visitors eventually won by five wickets. But how wonderful it was that the ‘greatest game’ has a new Test-playing nation, and that real cricket – the kind where a whole narrative builds over several days – now has a chance to thrive on a new field. If only it was shown live on TV, when there would be a chance of more young Niall O’Briens falling in love with the game. But I fear the cash register prevails and therefore we have little chance of broadening its appeal.